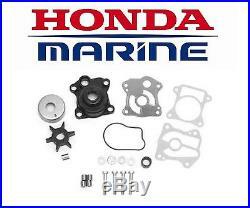 Honda 4-Stroke Outboard Water Pump Repair Kit. This kit provides all the items required to repair / rebuild the water pump on the following Honda outboard models. All the items are Genuine Honda parts and the kit contains the following. 1 x Impeller Housing (19221-ZV5-000). 1 x Housing Insert (19223-ZV5-000). 1 x Impeller Gasket (19233-ZV5-000). 1 x Impeller Gasket (19242-ZV5-000). 1 x Water Pump Seal (91356-ZV5-000). 1 x Impeller Wear Plate (19231-ZV5-000). 4 x Bolts (90103-ZY1-000) 4 x Collar (91555-ZV5-000) 1 x Water Tube Seal (19253-ZV5-000). 1 x Impeller Key (90752-ZV5-003). Water pump repairs kits for other Honda models are available. Please call for details or see my other items. We only stock genuine Honda parts & accessories. The item "Honda 40/50hp (BF40A/BF50A/BF40D/BF50D) 4-Stroke Outboard Water Pump Repair Kit" is in sale since Friday, March 18, 2016. This item is in the category "Vehicle Parts & Accessories\Boats Parts & Accessories\Boats Parts & Maintenance". The seller is "marinetech-yamaha" and is located in Norwich, Norfolk.